Val Gardena (Gröden) is not only in the heart of the Dolomites, but the epicentre of traditional Ladin culture. It offers excellent alpine hiking. Val Gardena (Gröden) is situated in the heart of the Dolomites in north-eastern Italy, and is under an hour’s drive from the city of Bolzano (Bozen in German), which lies to the east. The mountainous terrain is celebrated for being one of the country’s finest skiing areas (with peaks soaring to heights of 3,181m (10,436ft), but in the warmer months, the area is transformed into a haven for hikers. There are three typically alpine villages in Val Gardena: Selva Gardena (Wolkenstein), S. Cristina (St. Christina) and Ortisei (St. Ulrich). All provide excellent bases from which to explore the region. Unusually, the region is tri-lingual. Although both German and Italian are widely spoken, the principal dialect is Ladin, or to be more precise, a specific form of Ladin, known locally as Gardenese (Grödnerisch in German, or Gherdëina in Ladin). This gives Val Gardena a very distinctive personality; a fascinating blend of laid-back Mediterranean attitude, Austrian-inspired alpine ambiance and traditional Ladin culture. Hiking, as you might expect, is excellent in Val Gardena. The surrounding meadows are famous for their prolific alpine floral displays and the Dolomites provide plenty of walking trails and more challenging climbs. The nearby Puez-Geisler Nature Reserve (Parco Naturale Puez-Odle) is also excellent for walking; and covers 23,000 acres of land in total, providing plenty of scope for intrepid walkers to go exploring; with karst formations, alpine meadows and woodland. Although Val Gardena is at its most lively in the winter months, it is still very popular in the summer, and caters well for enthusiastic hikers; with plenty of cable cars, mountain huts and hiker’s buses in the region. 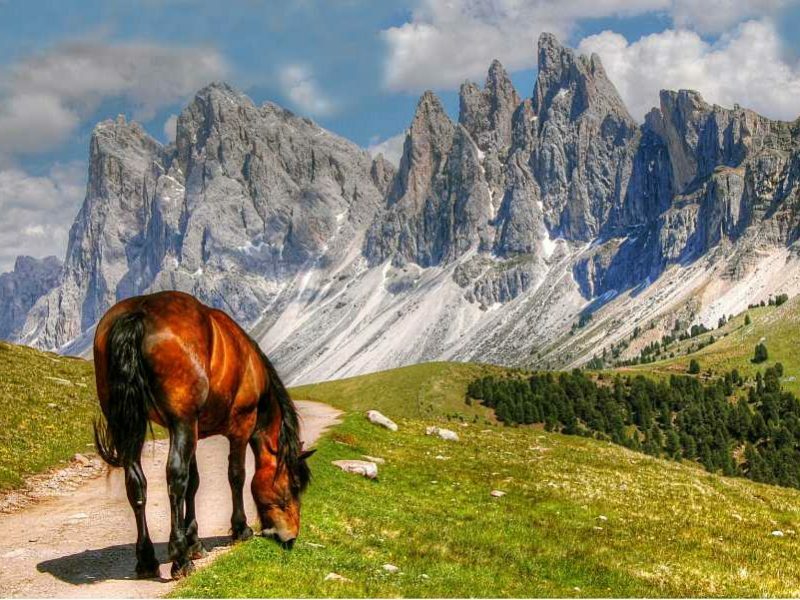 Val Gardena caters extremely well for walkers, and has a huge number of marked paths on offer. In the surrounding mountains, there are numerous mountain huts, from rugged walkers’ refuges to star-rated mountain hotels, which is ideal for those planning to spend some time trekking from hut to hut – or simply if you are looking for a lunch spot during a hike. The themed trails are a good way of gaining insight into Val Gardena. Notable walks include the ‘Legend Trail’, which begins at the historic church in S. Cristina and the hour long ‘Adventure Trail’ which starts at the chair-lift at Mont Sëura. Aside from the excellent walking, there are plenty of other things to do in Val Gardena. There are several Via Ferrata routes, and if you’re experienced you’ll relish challenges such as the Pössnecker Klettersteig, which is one of the oldest supported climbing routes in the Dolomites (dating back to 1912) and still remains one of the toughest. The Brigada Tridentina is also popular Via Ferrata, and thanks to its remarkable views, is one of the best known routes in the Dolomites. Mountain biking has, in recent years, picked up considerable popularity, and Val Gardena is now regarded as one of the best places to cycle in the Dolomites. There are numerous biking trails, including the challenging Sella Ronda tour for experienced cyclists to try. If you’re looking for something less physically challenging, the villages provide the perfect location in which to relax and watch the world go by. Each village is rich in Ladin culture and a traditional meal in one of the many eating establishments is highly recommended. Val Gardena’s illustrious reputation as being one of the wood-carving capitals of the world is evident in all the villages, and there are plenty of shops selling some of the excellent locally carved products. The Museum de Gherdëina in Ortisei has a range of fascinating folk art and crafts created by the local people and is well worth a visit. Alternatively, you can explore some of the castles in the area. The tumbledown ruins of Wolkenstein Castle provide quite an atmosphere, not to mention an intriguing history; as do the ruins of the legendary Stetteneck Castle, which dates back to the 13th century. A number of international airports are relatively close to Val Gardena, with the nearest being at Innsbruck (116km/72mi away). Treviso Airport, located to the north of Venice, is only 190km (118mi) away, and Marco Polo Airport (coast of Venice lagoon) is 199km (124mi) away. Many of the Italian airports offer a weekend shuttle bus to the Dolomites, but you may find it easier to make your way into the region by car. Selva Gardena, S. Cristina and Ortisei are remarkably easy to get to, given their location in the heart of the Dolomites; and all are situated only a few kilometres away from the motorway route between Bressanone and Bolzano. Alternatively, if you are not travelling by car, the nearest main railway station is at Bressanone (Brixen), which is approximately 18km (11mi) away.